My husband and I (+son) just got back last night from our family holiday to Melbourne. We were graciously offered babysitting by our sister inlaw so that we could go out on a date on our last night there. It's rare and wonderful to be given that opportunity, because going out with our 1.5 yr old tank of a son, to a restaurant, is usually like setting off a few party poppers right next to someone's ear. It's loud, busy, frantic, and messy; and we just want to get in and out of there alive and with as few dirty looks as possible. It wasn't hard to decide where we wanted to go. We had heard about and seen Chef Johnny Di Francesco (who trained as a chef in Italy) on Australia's morning show, Sunrise. 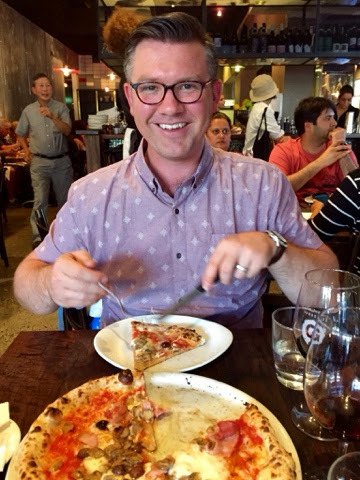 In 2014 he beat out 600 other competitors in Italy at the World Pizza Championship, and took home the award of Best Pizza Margherita. 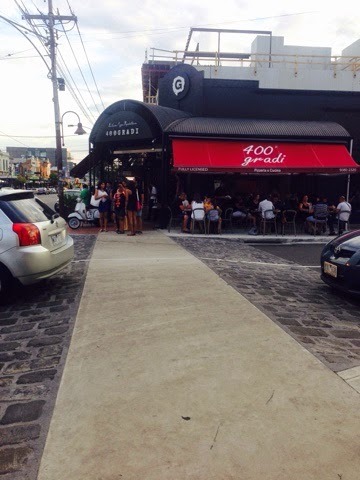 We got a little lost on our way but finally made it to Johnny De Francesco's restaurant 400 Gradi in Brunswick. Thankfully this extremely busy restaurant (with a line out the door) didn't give our table away even though we were 5 minutes late. It seemed to us that every one of the waiters there were Italian. 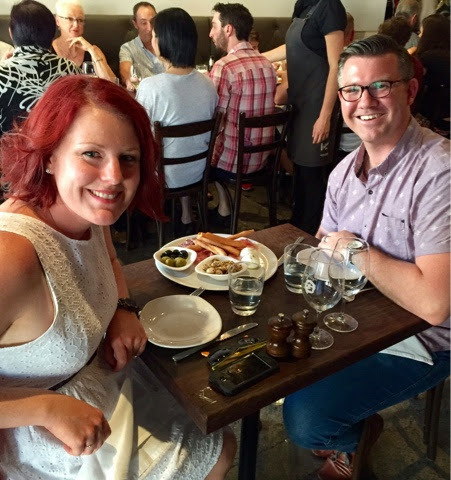 We were humoured while waiting for our dinner by watching two staff having a heated conversation, which no one could hear because of the hundred other conversations taking place. For us it just added to the raw Italian feel of the place, you know? Two impassioned Italians in this setting - could we get more stereo-tyipcal if we tried? David was so embarrassed that I asked the waiter for a photo, but like I said date night's are rare, and I'm also a blogger who wanted to capture the moment so I could tell you all about this delicious experience. 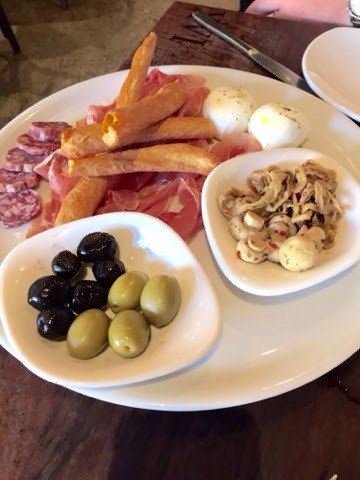 We started out with Piatto di Antipasto - cured meats, Italian cheeses, olives and marinated vegetables. I have never had prosciutto that tasted so good and just melted in my mouth. It redeemed past experiences where I have eaten slightly dry and chewier prosciutto; like at my wedding reception where I actually gagged hard on a piece of the stuff. I'm so glad Dave decided to order us some greens. 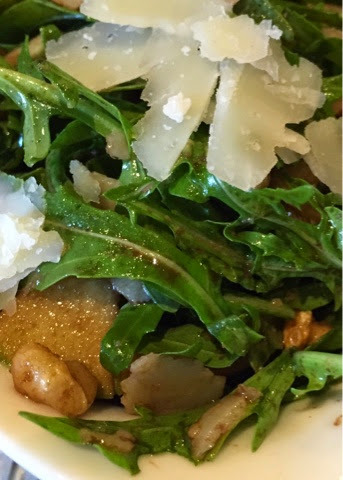 This yummy salad of rocket, apple, walnuts and freshly grated parmesan was a hit with us also. 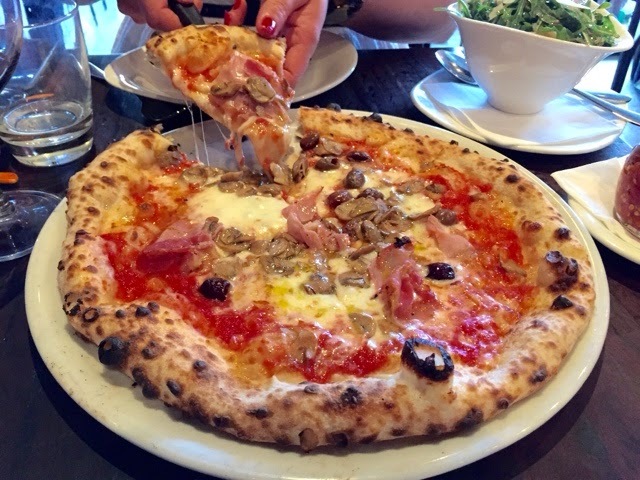 We ordered the Guancia - Matera, san marzano tomato, Fior di latte, pancetta, mushrooms, olives and loved every bite. The dough was light and thin where it should be - but not crispy and the crust was puffy and heavier than the base. It was the way pizza should be, in my humble quadruple citizen, but still not Italian, opinion. David had to remind me this was knife and fork pizza. If we could go back we would love to try their pastas and dessert. Back on topic, I give 400 Gradi a 5/5 and a MUST TRY and MUST DO AGAIN! **This is not a sponsored post. We wish, but it was worth every penny. That whole meal looks amazing! Now I really want pizza. 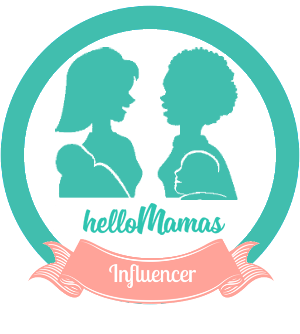 I'm going to Melbourne for the bloggers bbq in a few weeks, but we won't have time to go exploring or I'd go and try the pizza for sure. I'm sure your brother will be impressed with the short photo being on the internet! I love pizza. It's probably my favourite food if it's done right. I want to eat pizza now. Not that exact type because I don't like olives or pancetta but something with spicy pepperoni. Yum. Wow, this sounds delicious. I love a good pizza and find the only way to get that is to do it myself. Maybe next time I'm in Melbourne I will track this place down. Date nights are few and far between for me too, though I am going out Thursday night!!! Oh man, that is the pizza to beat all pizzas. We've recently discovered that our favourite dine in gourmet pizza place also does take away. We cannot wait! Haha! 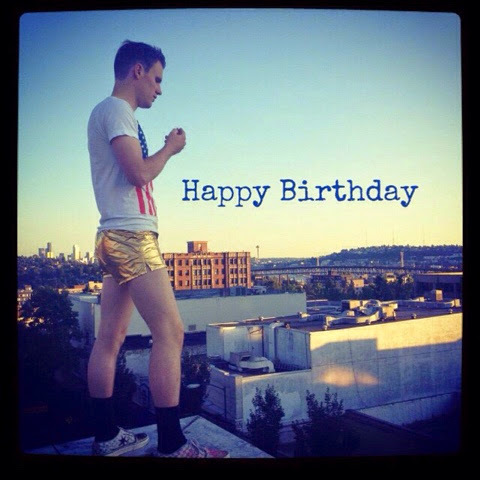 I do hope Josiah knew you were posting a photo of him on your blog! Sweet sibling revenge :) I love Melbourne and all the different types of wonderful restaurants! Guancia sounds amazing! @Grace HA! Yes, he knew. I'm sure he loved it. I bought the Melbourne entertainment book for our trip and we barely scratched the surface. There's so many options there. It's overwhelming. @The Plumbette I think it's my husbands favorited food. He was stoked when I suggested it instead of a fine dining date. We were staying so close to the crown but wanted to go to the original one. Good to know the Crown is kid friendly. We might end up there next time we are in Melbourne...that time could not come any more quickly! @TeganMC I saw a woman come in and leave with two takeaway boxes so you must be able to do that option at 400 Gradi too. How nice for the locals. Hugzilla, I think that Kylie is missing out not having my brother as her mascot or something strange like that. @EssentiallyJess They have a spicy pepperoni on the menu just for you, I swear! @Toni I'm hoping I get to go to that BBQ too but haven't been told yet if I got the allowance for the flight. I'd have to figure out where to stay and how to get around by myself. Daunting thought. @Jess Do it! And then tell me if I was right or wrong!